MSNBC's Donnie Deutsch just called (on air!) for advertisers to boycott Glenn Beck for his "Obama is a racist" screed on Fox (faux) News, after Fox News refused to take responsibility for Beck on their station (they said he was entitled to his opinion...). "He called this president a 'racist' and a 'hatred of white people', okay? This has to stop. Here's the only way this stops. 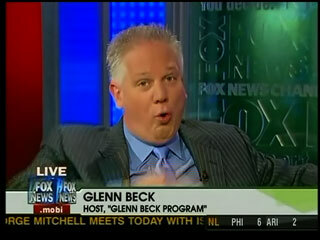 The reason this man does this, this Glenn Beck does this, is because it attracts viewers, it creates controversy." Beck: Obama is "colorless ... he might as well be white"
On the February 12 broadcast of his nationally syndicated radio show, Glenn Beck featured Philadelphia-based conservative radio host Dom Giordano, who claimed that "the mainstream media has dubbed [Sen. Barack Obama (D-IL)] to be African-American" and said, "If you start to, you know, delve around the edges, say, 'Wait a minute, isn't he mixed race? Weren't we told that last year?' Or whatever, biracial. Not allowed to say that anymore." Beck responded by saying "he's very white in many ways," adding, "Gee, can I even say that? Can I even say that without somebody else starting a campaign saying, 'What does he mean, "He's very white?" ' He is. He's very white." Beck: Obama has "exposed himself as a guy" with "a deep seated hatred for white people"